Whew! The Chicago winter has indeed arrived. We put in a wood burning stove last year, and between having that going and multiple pots of jasmine tea, I'm surviving quite well. My husband, Jay, got me a new thistle feeder, so we put that up along with a suet cake and another feeder a couple of days ago. The birds have found it all and the yard seems alive again. Well the holiday season, and several illustration jobs make for a busy time of year, but I have a few things for the Aviary that I'll be posting this week and next. I went into the museum yesterday. Several birds had been set aside for me to make into study skins, and this was one of them. Piplio erythrophthalmus is a mouthful of latin, and in looking at the female I was handed I initially thought it was a female junco on steroids. Towhees are part of the family Emberizidae. In North America, this family mainly consists of birds known as sparrows and juncos (so maybe I wasn't soooo far off with my junco on steroids hypothesis!). Their thick bills are perfectly adapted to seed eating. Like many birds in this family, Towhees spend a good deal of time on the ground scratching up their food. They'll kick up leaf litter to dislodge tiny arthropods. 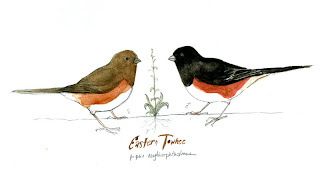 The male Eastern Towhee is a very striking bird with its dark upper plumage and splashes of burnt sienna on the sides. The females have similar patterning with the exception of being more of an umber brown on top. There was an interesting fact on the Birds of North America site, stating that the first time this species of towhee was recorded by a European was by John White on a visit to the aborted settlement on Roanoke Island in 1585.